You can view your organization's existing groups and group members using the Azure portal. Groups are used to manage users (members) that all need the same access and permissions for potentially restricted apps and services. In this quickstart, you’ll view all of your organization's existing groups and view the assigned members. Create an Azure Active Directory tenant. For more information, see Access the Azure Active Directory portal and create a new tenant. You must sign in to the Azure portal using a Global administrator account for the directory. 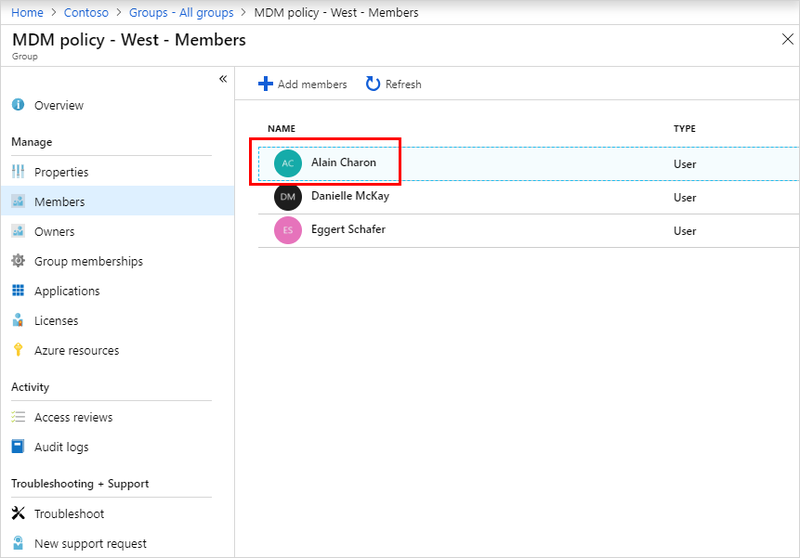 Create a new group, named MDM policy - West. For more information about creating a group, see How to create a basic group and add members. Select Azure Active Directory, Groups, and then select New group. Create a new user, named Alain Charon. A user must exist before being added as a group member. For more information about creating a user, see How to add or delete users. Select Azure Active Directory, Users, and then select New user. Copy the auto-generated password provided in the Password box, and then select Create. Now that you have a group and a user, you can add Alain Charon as a member to the MDM policy - West group. For more information about adding group members, see How to add or remove group members. Select Azure Active Directory > Groups. From the Groups - All groups page, search for and select the MDM policy - West group. Select Add members, and then search and select Alain Charon. You can see all the groups for your organization in the Groups - All groups page of the Azure portal. The Groups - All groups page appears, showing all your active groups. Search the Groups – All groups page to find the MDM policy – West group. From the Groups - All groups page, type MDM into the Search box. The search results appear under the Search box, including the MDM policy - West group. 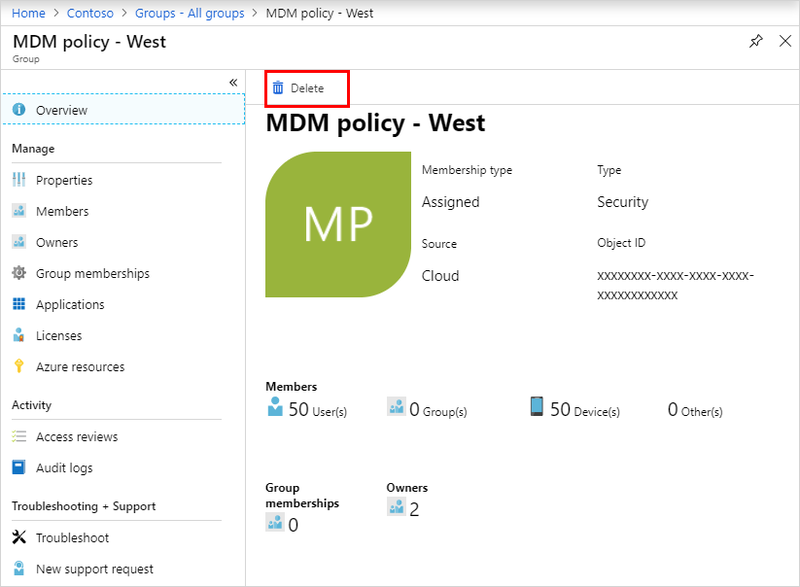 Select the group MDM policy – West. 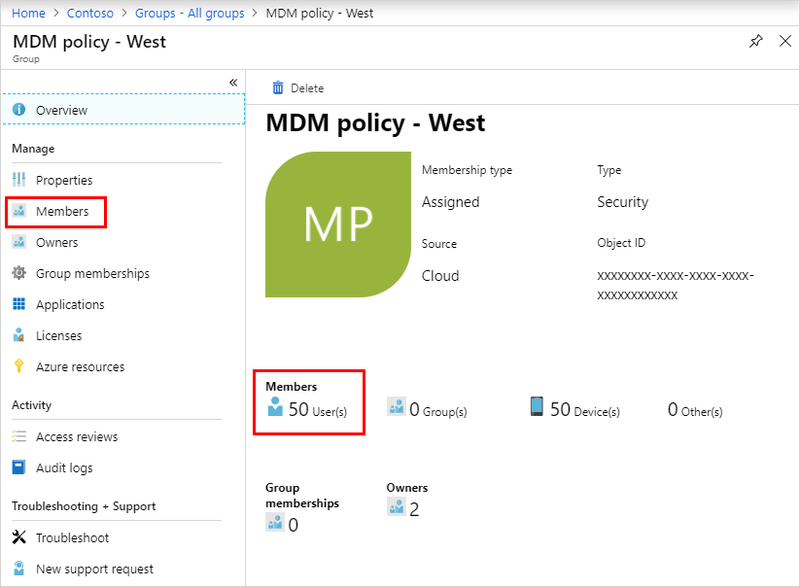 View the group info on the MDM policy - West Overview page, including the number of members of that group. Now that you’ve found the group, you can view all the assigned members. Select Members from the Manage area, and then review the complete list of member names assigned to that specific group, including Alain Charon. On the Groups - All groups page, search for the MDM policy - West group. Select the MDM policy - West group. The MDM policy - West Overview page appears. The group and its associated members are deleted. This doesn't delete the user Alain Charon, just his membership in the deleted group. Advance to the next article to learn how to associate a subscription to your Azure AD directory.